A comprehensive comparison between Angular and React is imminent because there are certain places in which they significantly overlap in terms of what they offer, i.e. building the front-end view of your application and other places where their functionality remains incomplete unless helped by a third-party library. Adopting one technology over the other is a question of whether Angular or React better solves your problem and a bit of intuition. In this tutorial, we’ll compare and contrast seven key different features of Angular and React. I am an ardent proponent of the code-first approach (code speaks louder than words, they say). Keeping this in mind, I’ve added code samples of Angular and React wherever possible so that you can build on your intuition and decide which works for you and which doesn’t. Let’s get started. Angular is a framework, while React is a library. The user clicks on a React element. An action is fired. This action is dispatched to a Store via a Dispatcher library. The Store keeps track of the application’s state and data retrieval methods. Any update to the state is reflected in the views, and this helps to keep the views consistent with the state of the application. Doesn’t make sense? This figure should sort it out for you. 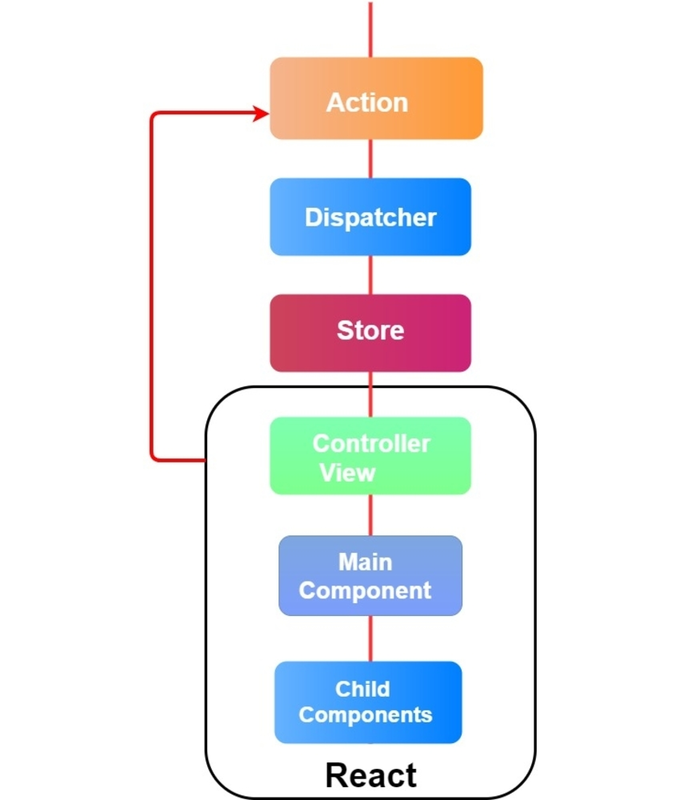 Flux complements React and implements the concept of Unidirectional data flow. Angular is a framework for building client applications. AngularJS was firmly built on top of the MVC pattern, which separated the application into three different layers. The combination of model, view, and controller plus the added complexity involved in mastering directives, factories, services and other components to create a single-page application forced the developers at Google to shift towards a component-based architecture. But when your application starts to grow, it’s important to have a solid structure that keeps the business logic of your application away from the components. Being a framework, Angular allows you to enforce structural organization by moving the business rules into a domain model (using a combination of model classes and services) and injecting the model into your components via dependency injection. Here is a sample of code that illustrates how the business logic is encapsulated inside a User model and a User service, and away from our component. What are components? In Angular, components are TypeScript classes that have a @Component decorator marked over them. Moreover, inside these decorators, we can define what Angular calls the meta-data, which includes the template, styles, selectors and so forth. Component hierarchy in Angular is designed in such a way that you can associate structure and functionality under a single entity. Here is a high-level architectural overview of components and how this links to everything else in Angular. The architecture of Angular. Component at the center, and everything else revolves around it. 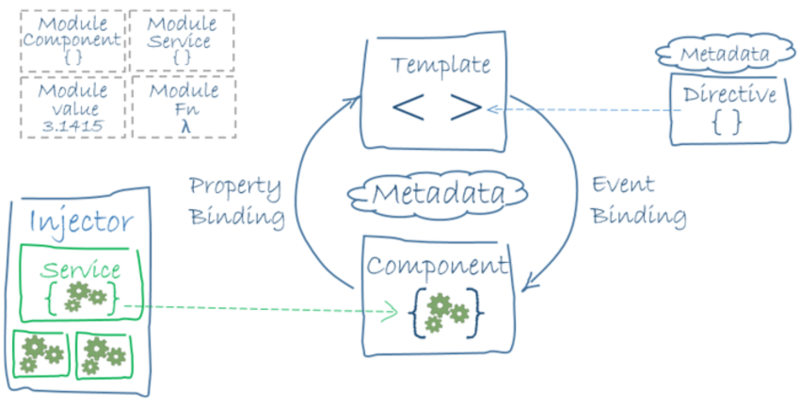 Data sharing among components is possible by nesting components, as exemplified below. // The <user-child> selector is nested inside <user-parent>. Each user is passed down as a property. <user-child *ngFor="let user of users"
We will be adhering to the ES6 standards for composing components henceforth because that is what Facebook recommends. Each React component accepts an arbitrary number of inputs, which is stored inside an object named props. It also has a render method, and as the name suggests, this method determines what will be rendered when the component is invoked. Each component maintains an internal state (via this.state), and every time the state changes, the render function of that component is invoked again. Let's dive into React, shall we? One of the important language features in React is evident in this code sample. Static type checking is performed at compile time. The compiler warns you about potential type mismatches and detects certain errors that would otherwise go unnoticed. Additionally, defining a contract on a variable, a property, or the parameters of a function can result in more readable and maintainable code. Variable and function declarations are made more expressive by declaring their data types. You can read more about the different primitive data types in the TypeScript documentation. Defining the signature of an API using an interface makes the code less ambiguous and easier to comprehend. The interface serves as a quick start guide that helps you get started with code immediately and saves time otherwise spent on reading the documentation or the actual implementation of the library. The type keyword in TypeScript can be used to create an alias for a type. You can then create new types which are a union or intersection of these primitive types. getAge(ofSusan); // You are 21! getAge(ofTyler); // You are thirty one! React has limited support for type checking because the underlying ES6 doesn’t support it. Nevertheless, you can implement type checking using the prop-types library developed by the React team. Type checking the props of a component to check whether it is a string can be done as shown below. Starting a project from the ground up might seem fun initially. However, the process of setting up the directory structure, writing boilerplate code for components, and getting the application bootstrapped is a futile and unproductive exercise. Your strategy should be to get on with it as quickly as possible and focus on the actual development of the application. Thanks to Google and Facebook, you have tools available to create and scaffold your applications with ease. Setting up Angular-CLI for angular and create-react-app for React is straightforward using npm. But that's not it. The ng generate command lets you generate components, routes, pipes, directives, and services. Angular CLI can do a lot more, like creating a build of your Angular app, commands for running unit tests, and end-to-end testing. You can read more about it on GitHub. On the other hand, create-react-app is the officially supported way of creating a React app without any configuration files. This should create a functional React app with all the Babel and webpack dependencies taken care of. You can start running the app on your browser using npm start. You can find the scripts available for the react app in the package.json file. Data binding is a feature that enables synchronization of data between the application state (model) and the view. In a one-way data binding routine, any change in the state of the application automagically updates the view. On the contrary, two-way data binding binds together properties and events under a single entity, i.e. any modification of the model updates the view and vice versa. In React, the properties are passed down from parent to child components, which is known as the unidirectional or top-down data flow. The state of a component is encapsulated and is not accessible to other components unless it is passed down to a child component as a prop, i.e. the state of a component becomes the prop of the child component. But what if you need to propagate the data up through the component tree? This is done through child events and parent callbacks. The React documentation includes a good example that deals with such a scenario. Data binding techniques available in Angular are among a few features that make it interesting. Angular has out-of-the-box support for interpolation, one-way binding, two-way binding, and event binding. Interpolation is the simplest way to bind your component property inside the text between your HTML tags and attribute assignments. Property binding is similar to interpolation in the sense that you can bind the properties of your view elements to component properties. Property binding favors component communication and is identical to how props are passed down in React. Event bindings allow data flow in the opposite direction, i.e. from an element to a component. Here, click is a target event, and on the right, we have the onSave() method that gets invoked when the event occurs. But the most important feature is the two-way binding using the [(ngModel)]. This merges the property binding and event binding under one directive and is particularly useful with forms and input fields. But client-side rendering has the drawbacks that it doesn’t work great for SEO and that it returns incomplete HTML content when you share your link on social media sites. Angular has a solution called Angular Universal that takes care of making your app search engine friendly and social media friendly. It’s a library built by the Angular team, and using it is definitely favored. Universal makes use of a pre-rendering technique where the whole website is rendered from the server first, and after a couple of seconds, the user is switched to the client-side rendering. Since all this happens under the hood, the user doesn’t notice anything different. If you are using React with Redux, the Redux documentation has a good tutorial on setting up server rendering. You can also set up React to render from the server using the BrowserRouter and StaticRouter components available in the react-router library. You can read more about it in this Medium article. But if you are into performance and optimization, you can try next.js, which is a library for SSR in React. 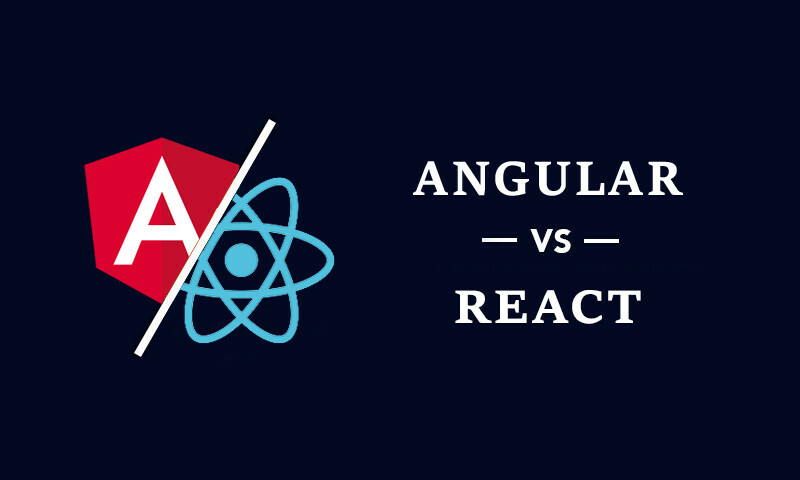 What are your thoughts on Angular vs. React? Do share them in the comments below.